This 2 kinds sparkling ornament bath bomb set will fill the bathtub with soft and fluffy bubbles that leaves the skin silky smooth and aromatic scents that leaves the mind relaxed. 1) Place the bath bomb under running water as the bath tub fills up with warm water. 2) If any pieces of the bath bomb remains, crumble it with your hand under running water. 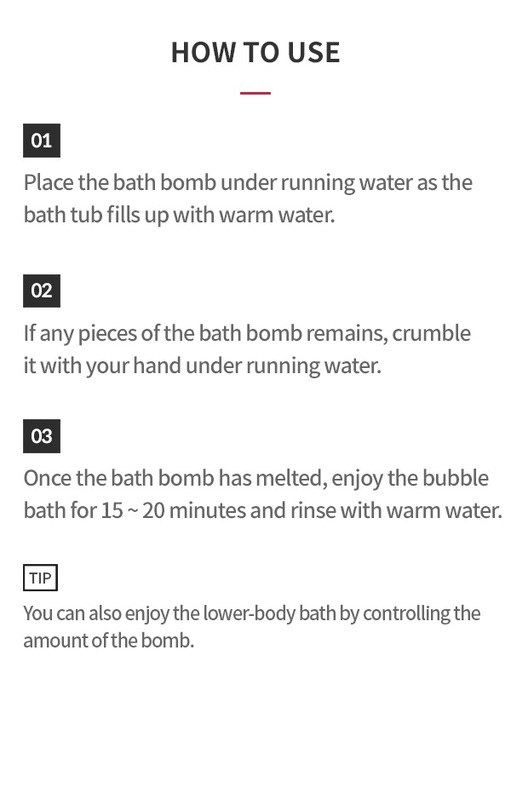 3) Once the bath bomb has melted, enjoy the bubble bath for 15~20 minutes and rinse with warm water. 1) Avoid contact with eyes, wash your eyes thoroughly with clean water immediately. 4) Check any irritation develops by apply to part of skin before using. 5) Contains high concentration of AHA ingredients, consult a doctor about side effects before using. 6) Keep out of reach of children. 7) Keep in dry cool place, avoiding direct sunlight.